(Natural News) There are many reasons that people are suffering from so many illnesses today. From toxic onslaughts to poor food choices, the amount of trip wires on the road to good health can be nauseating and can paralyze people into doing nothing at all. After all, who has time to investigate how to become truly healthy? It can be a full-time job! Fortunately, there have been discoveries that have allowed us to tap into clean and nutrient dense superfoods to knock down the body debt that most of us have incurred, without spending all our spare time in the grocery store and in the kitchen. 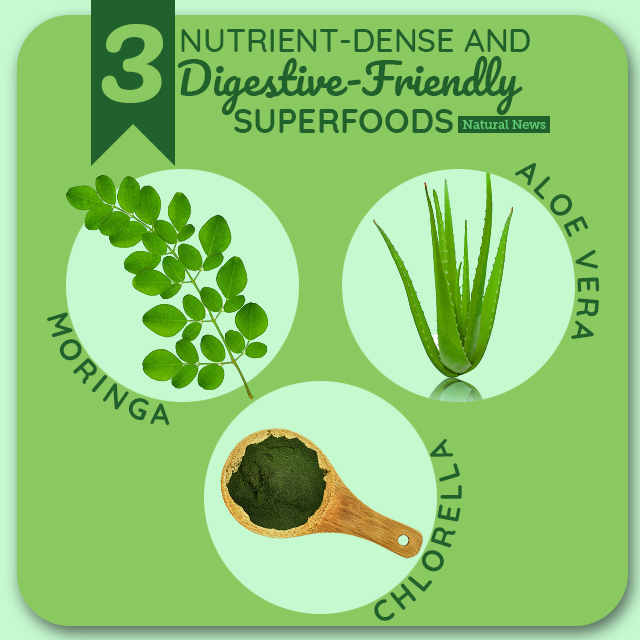 Here are three superfoods that are easy to consume on a daily basis while also being digestive friendly. Affectionately known as the “miracle tree,” moringa has caused quite a stir over the past few years and has reached a heightened popularity that could make it the next big superfood star. Made up of nutrient dense leaves that are typically dried and ground up into a super fine powder, it’s an easy addition to any superfood smoothie and can be also consumed as a tea. As for nutrients, it contains over 90 vitamins (vitamins A through K) and minerals (such as calcium, potassium, iron, magnesium, phosphorus, and zinc), all 9 essential amino acids and 9 non-essential amino acids, as well as an incredible antioxidant profile. This creates a chlorophyll rich and deeply alkaline food that is easy on digestion and can benefit nearly anyone in their health goals. Perhaps one of the original superfoods, aloe vera has been revered for decades due to it’s incredible ability to heal various ailments. It’s been called the “plant of immortality” and the “medicine plant” for good reason. Traditionally used as a topical ointment for skin support, aloe vera is much more than a soothing gel for burned skin. In fact, the benefits multiply when taken internally, due to it’s impressive nutritional profile that is a serious boon to digestive support. It contains a dozen vitamins, including A, C, E, and B12, and several minerals such as calcium, chromium, selenium, iron, magnesium, potassium, and zinc. It also has 20 of the 22 human required amino acids, and 7 of the 9 essential amino acids. Combine that with over 200 active plant compounds like phytonutrients, enzymes, triterpenes, and polysaccharides, and you get a serous dose of natural medicine! The only kicker is that most good aloe vera products are very bitter (due to the nature of the plant), and are not easily incorporated into a simple solution like a smoothie without negatively altering the taste. However, thanks to things like freeze-dried technology, you can mitigate that bitterness and avoid the toxic preservatives in some popular liquid aloe vera products, like sodium benzoate. Try the Health Ranger’s 100% Organize Freeze Dried Aloe Vera Extract, for a clean, potent, preservative free, and smoothie friendly source. Chlorella is arguably the most powerful superfood on the planet. A single-celled micro-algae grown in water, it is often referred to as the perfect food due to its blend of health promoting nutrients. If there was only one supplement one could ever use, chlorella should be near the top of the list. So what type of nutrition could you expect to get from chlorella? Well, first of all, you get an incredibly rich source of highly digestible protein (58 percent of weight). You would also obtain vitamins A, C, E, and K, as well as the entire B-complex, and minerals such as iron, magnesium, zinc, phosphorus, calcium, iodine, manganese, and potassium. It is also high in essential fatty acids (EFA’s), dietary nucleic acids like RNA and DNA, as well as antioxidants, enzymes, and other phytonutrients. For some of the health benefits obtained from chlorella, read Healing Benefits of Chlorella. As an added bonus, chlorella also promotes the production of healthy flora and probiotics which help support a healthy digestive process. However, this can be lost if the chlorella is not properly produced for human consumption, or if it is grown in toxic conditions. Fortunately, “cracked cell wall” chlorella has helped reduce the issue with digestibility, and those that are grown indoors to avoid toxic environmental elements have also had the typical contamination found in many chlorella products removed. Even more promising is the production of a fermented chlorella, which trumps the cracked cell wall technology to create an incredibly bioavailable product that is super easy on the digestive process. Add in tightly controlled environmental conditions and lab-verification for heavy metals and microbiological contamination, and you get the Health Ranger’s Fermented Chlorella, a true breakthrough in consumable superfoods. So, if you figure you could use some more nutrients that will be easy on the digestion and support alkalinity, these three superfoods will fit the bill. Throw them all in a smoothie and you will have quaffed back more nutrition than most people get in a week. 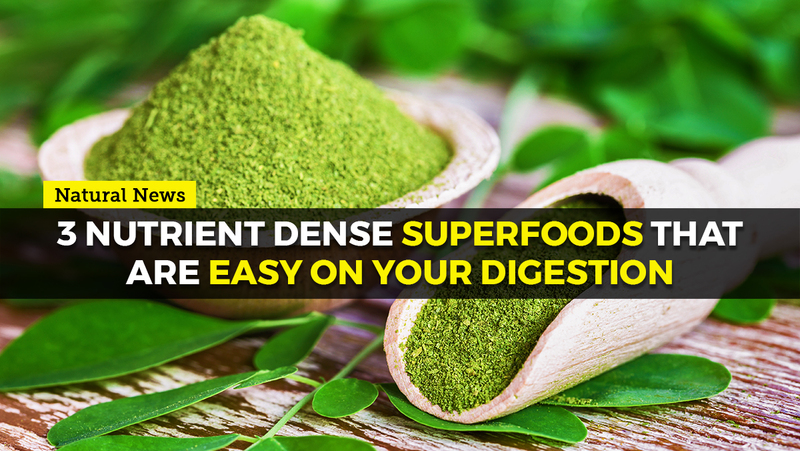 For more information on nutrient dense foods, visit Superfood.news.